You must give Blaze Bayley credit for an extraordinary amount of emotional fortitude and heavy metal perseverance. His latest live work, The Night That Will Not Die, was recorded (in Switzerland) less than three months after the tragic death of longtime friend, then wife, and manager, Debbie Hartland. Call it music therapy or simple iron-willed determination, Bayley let the show go on and we are better for it. Reviewed hear is the CD, the soundtrack to the DVD, which includes one extra song. The Night That Will Not Die includes a tour-de-force of 21 songs covering the breadth and depth of Bayley' heavy metal singing career. The emphasis is primarily on his solo work, as it should be, with only a few references to his brief stint with Iron Maiden in the 1990s (the best being Lord Of The Flies). With all respect to Mr. Bayley, in this mix I think he gets a little shortchanged as his vocal performance sounds muddy at times. But this may simply be due to his low bass-baritone range which can easily become entangled with the rhythm section. In the end after a song or two, your ears will discriminate Bayley of the rest. Otherwise, Bayley and crew are in fine form throughout, and the audience is lively and appreciative. Notable efforts include Smile Back At Death, Kill And Destroy, Ten Seconds, Stare At The Sun, and Born A Stranger to mention only a few. Of course, always the gentleman, Bayley both coaxes the crowd and thanks them profusely for their support. 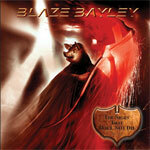 Blaze Bayley fans will love The Night That Will Not Die and should pick up both DVD and CD for a grand heavy metal time. Bayley and company are extremely tight and engaging as they blister through a catalog of Bayley greats. Very recommended!